Adamscourt is a beautiful home, steeped in character and set in beautiful, landscaped gardens, with many seated areas. The gardens are completely enclosed, which enables all of our residents to enjoy them, whilst maintaining their safety. Situated in Talbot Woods, on a tree lined avenue. Adamscourt is part of Gold Standard Framework for End of Life Care. Accredited in 2013, the result of a 3 year programme. We were re accredited in 2017 and will be re accredited every 3 years. This award reflects how well we all recognise individuality and how well we work with other agencies, such as GP's and district nurses, to ensure the best quality of care and choice is offered to every resident. We offer excellent end of life care but also ensure that each person lives well and with choice. Adamscourt has a homely, calm feel and we aim to make every day a good day for all of our residents. Individual, person centered care plans ensure that the best possible care is given to each individual. We have a daily activities programme aimed at large groups, small groups and individual activities. We have outside entertainers every week, we go out on our mini bus every week, sometimes twice a week, we also take individuals out on a one to one basis to shop or just go for a coffee. We are linked with Talbot Junior School and have several links to the local community, bringing the community in to us and us taking the residents into the community. These prices are only a guideline, please press the Request Information button or call a member of our team free on 03338804169 to find out the exact price for your requirements. Ground Floor single room with en suite facilities. 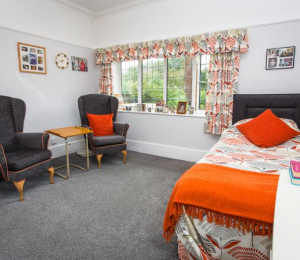 This tastefully decorated and spacious room has direct access to the communal gardens and the rear of the property. First floor single room overlooking the front aspect of the property, a spacious and tastefully decorated room. 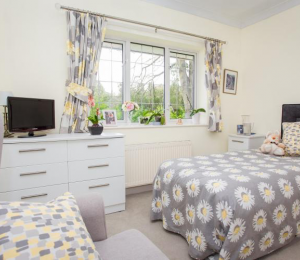 Tastefully decorated and spacious first floor single room with en suite facilities, rear aspect views overlooking the gardens. This is the parent company for the two homes within the group.